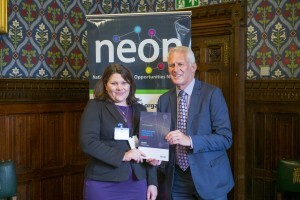 The third annual NEON Awards was held this on 18th May 2016 at the Palace of Westminster. 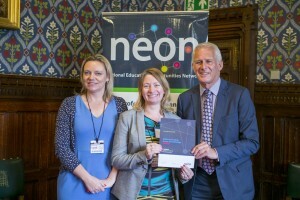 Hosted by Gordon Marsden (MP for Blackpool South and Shadow Minister of Higher Education, Further Education and Skills), the 2016 NEON Awards saw over 50 nominations. 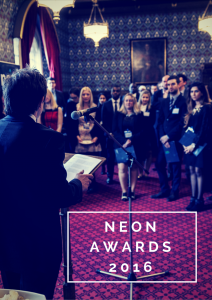 Please see below for the winners and commendations from the 2016 NEON Awards. Based in the most deprived areas of Oxfordshire and the surrounding region, the aim of Brookes Bridges is to up or re-skill adults who have previously left formal education and who are motivated to progress to further and higher education. The project offers short community based courses as a means of progression into higher education and therefore employment. Brookes Bridges has been extremely effective in targeting mature learners – 93% of learners were aged over 21 when they participated, 66% of participants would be first generation HE and 41% are from a BME background. An estimated 35% of participants entered formal education at level 3 or below within 6 months of completing a Brookes Bridges programme. Recent analysis has shown that 24% of Brookes Bridges participants (2011/12 – 2014/15) have subsequently entered higher education, with just over half of these enrolling at Oxford Brookes. The First-Generation Scholars (FGS) programme at the University of Sussex provides an example of moving ‘beyond the bursary’ and support a broader range of initiatives. In addition to financial bursaries offered to those from lower-income households, the Study-Work Programme offers all FGS study skills support; promoted access to a wide range of careers themed workshops and careers consultations; and a Welcome Event in the autumn. FGS are also offered a wide range of funded experience opportunities, including paid summer internships, fully-funded internships in China, places on the Sussex International Summer School, research placements at the University of Pennsylvania, paid summer undergraduate research opportunities, and work shadowing for first-year students with support for travel costs. The FGS programme targets those from households with a household income currently less than £42,620, and those who are the first in their family to participate in higher education, two traditionally under-represented groups. Ciaran is the first person in his family to attend university and had little support with his initial application, applying twice before he was successful. This experience has led Ciaran to work tirelessly to ensure that other WP students do not have a similar experience. In 2014, Ciaran founded EdMed, a student led outreach initiative, where medical students act as ambassadors to promote studying medicine, with the aim of widening participation to the profession. It now has 90 medical student ambassadors who assist the committee in fulfilling its aims. Ciaran works endlessly alongside his studies on a number of initiatives as well as EdMed including founding Merseyside Young Medics, working on publishing a book for potential medical students and also developing WP research. He has delivered sessions to over 100 year 12 students in the Merseyside region over last 18 months. He has also delivered lectures on ‘The wonderful world of medicine’ to over 300 year 10 students to inspire them to consider a career in healthcare or medicine. Jenni has 15 years’ experience working in widening access and firmly believes in the power of higher education to contribute to social inclusion, transform individual lives and benefit society as a whole. Recognising that effective widening participation is underpinned by collaboration, she works hard to strengthen internal and external links and encourages her team to do so too. Jenni’s deep commitment to widening access, her engaging management style and her capacity for innovative strategic thinking are immediately apparent. In a very short space of time, Jenni has transformed Kingston’s WP team into a high-performing department that continues to make substantial progress against the University’s widening access goals. Jenni has pushed forward strongly across a range of highly innovative and challenging work – including the University’s care leavers project KU Cares – whilst keeping ‘business as usual’ in very good shape. Still a relatively young manager, she has been sure-footed, energetic and truly collaborative. 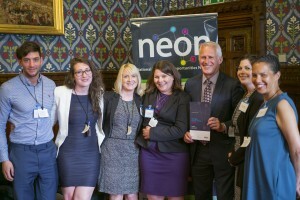 Jenni is in demand within the sector to share her expertise and under her leadership the Widening Participation team has won awards from The Guardian, THE and the University itself. Jean Baxter has worked to improve the lives of disadvantaged students for over two decades. She launched the University of Leicester’s outreach team in 2001, and before that worked within the University’s Welfare Team. With great skill and tenacity she not only secured external funding to expand the number of activities delivered but successfully leveraged this funding into permanent staff posts funded by the University. By the time she retired in 2015, Leicester’s outreach team had expanded to thirteen people with a further three about to be recruited. She built a community of WP practitioners that shaped the university’s approach to supporting those from disadvantaged backgrounds. 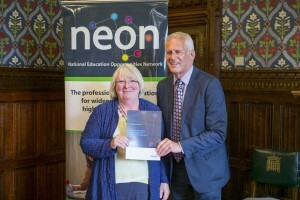 Jean directly led many successfully outreach activities but as her team expanded she particularly focused on directly delivering activities focused on supporting progression into medicine and enhancing mature students’ educational opportunities. She personally recruited and trained numerous medical students to act as mentors and deliver outreach activities. Given the heavy academic workload of these students, Jean would often meet them in the evenings and weekends to support the development/delivery of their activities. 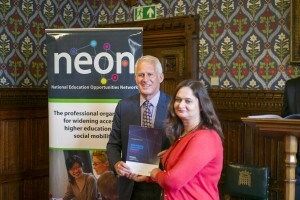 She tirelessly worked with local colleges to support their mature students’ progression to university. Travelled across Leicestershire and surrounding counties to talk to college students about what university could offer them. Every year she personally delivered a one-day student conference for over 100 mature students. Both these roles showed Jean’s unique gift for building sustainable outreach programmes. Knowing she was approaching semi-retirement, she successfully secured funding for staff members to continue and expand this work. Jean believed passionately in collaborative outreach. Kingston University’s commitment to access is enshrined in the University’s strategic plans and informs policy and activity throughout the institution. Kingston has the largest number of full-time first degree BME graduates within the sector and narrowing the BME attainment gap is a board level Key Performance Indicator. Using an evidence-based approach, Kingston targets learners from primary to tertiary levels, as well as groups facing specific barriers to educational progression such as looked-after children, young carers, mature learners and pupils with a disability or specific learning difference. 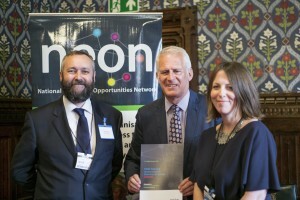 In 2014/15 Kingston’s Education Liaison team ran programmes for over 14,000 individuals to raise awareness, aspirations and attainment and provide learners with accurate information, advice and guidance regarding their higher education options. Kingston’s Compact Scheme began in 2006 and supports 1,000 new entrants each year from under-represented, disadvantaged and marginalised groups through the application, admissions and transition process. Additionally, Kingston is innovative in supporting care-experienced and estranged learners and support over 150 students from these backgrounds. Widening access is integral to Kingston’s academic values and it aims to create an accessible, relevant and purposeful curriculum that benefits its diverse student body. The Bourne Academy is an Academy school in the most deprived area in Bournemouth with the highest number of Pupil Premium students in the borough. A new sixth form, only in its third year, The Bourne Academy saw 50% of its first year group go onto University and 100% of students that applied through UCAS achieved their first choice or better through clearing. The Bourne Academy is continually investing in developing activities for its students to achieve their potential. The Bourne Academy’ governors, senior leadership team and all staff are committed to ensuring they engage and motivate their students into Higher Education.